Backed by a team of professionals, we are into manufacturing and supplying of Wire Pointing Machine for Construction. The offered product is manufactured using optimum quality raw materials. Machine for pointing and tapering of pipe ends. 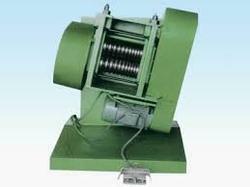 Push Pointing Machine is hydraulically operated for PUSH POINTING Tubular product prior to cold drawing. The Hydraulic Push Pointing Machine can handle sections having diameters 12 mm. O.D. minimum to 130 mm. O.D. maximum, both in Ferrous & Non-Ferrous. Larger size machines can also be offered. The firm is well renowned in the industry for offering a finest collection of Pointing with Threading Machine. To meet variegated demands of our esteemed clients, we are engaged in manufacturing an exclusive range of Copper Rod Pointing Machines. This machine is used for making a point in the copper rod. we are manufacturing machine up to 80 mm. We are recommended amongst the clients for offering a quality assured assortment of Pointing Machine. The Pointing Machine we offer is widely demanded amongst the clients for its durability and hassle free performance. Our products are made accordingly to meet the requirements of the clients.